Note the generous protected cockpit, small outboard in the well. CC19s are ideal for gunkholing and getting in shallow beaches. Standard hull with lifting centreplate, she rides easily on a trailer behind a fair size car. Note the beautiful and traditional lines on the lapstrake (clinker) hull. 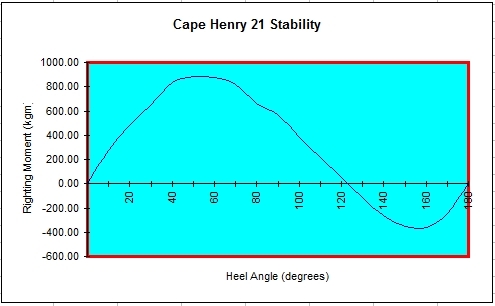 I have decided to cover the Cape Cutter 19 (CC19) and the Cape Henry 21 (CH21) together as they cover a number of variations on a single theme. The prospective owner or builder will doubtlessly spend quite a while mulling over these before choosing one! Boats, even leisure boats, exist for different reasons - racing, cruising, liveaboard, fishing, etc - and they all have their place in the sun. Day boats however, are the most special kind, because they exist purely for the fun of being on the water, for gunkholing, picnicking, camping, and simply going out to clear your head. They are generally smallish, traditional and good looking, and in my opinion maybe the purest design form available - pure art really! The CC19 and the CH21 are both brilliant examples of this. The CC19 was conceived by one Nick Voorhoeve - from memory about 1998? They were intended to compete in the "Cornish Crabber" market, popular in the UK and Europe. At that time the SA Rand was very weak against foreign currencies, and it was intended it would be built locally and exported in a 20 foot container. Dudley was commissioned to do the design - it is one of his own favourites and certainly one to be very proud of. See http://www.dixdesign.com/inspir19.htm for Dudley's own commentaries on this one. The design is very traditional and practical at the same time. She was designed originally for GRP production (or wood) with a lifting centreboard. The hull has a lapstrake look, quite beamy with a traditional looking cabin top. 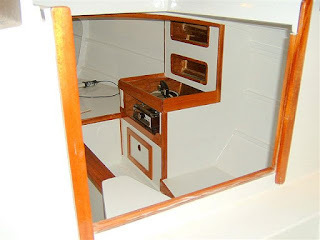 The gaff rig is easily demountable, and easily handled from the cockpit.There is a very neat well for a small inboard (this is a great feature). Rudder hangs over the traditional transom. Below, the space is quite vast for a 19 footer, and nicely laid out. Very adequate for a few nights aboard. Layouts are almost identical - the CH21 has slightly longer berths and a bit more elbow room. 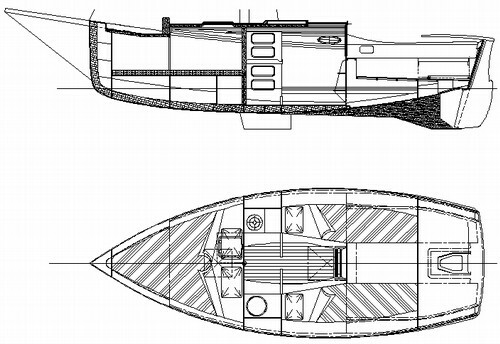 Note the option of fixed or bilge keels avoids the centreplate arrangement inside. The rig is a gaff with two headsails, both on roller-furlers, to be flown either/or - it is not actually a cutter rig - but offers great flexibility and offers a very traditional appearance. In nearly all conditions, astonishingly well. In light airs they fly like dinghies. In moderate winds they handle well, and in strong winds they manage much better than you'd expect.Lots of this is due to the very flexible sail plan, and the generous beam. While sailing a very large cat recently in Table bay, a CH21 crept up on us from a few miles behind. At first we couldn't see what it was, with many comments about how an old boat with a gaff rig could be moving that fast. Well in fact an old boat with a gaff rig simply can't go that fast - I then realised it must be a new boat and likely the new CH21 launched in Cape Town recently. Well it was - I snapped a pic of it near Sunset Beach. 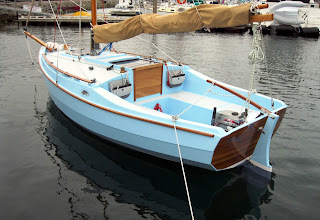 This particular one was built by Peter Randle, and has bilge-keels. It was doing a steady 6 knots in about 10 knots of wind on the beam, and slowly it slipped past us! 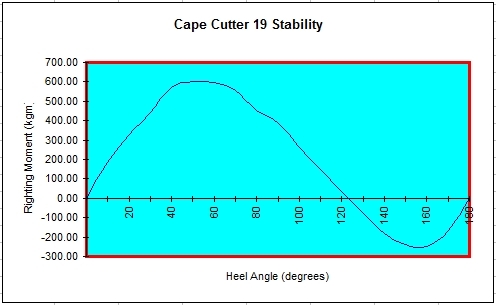 The Stability Curves for each of these boats show an A.V.S. slightly better than 120 degrees, which is really quite respectable, with plenty of reserve at 90 degrees. You can expect the bilge-keel version to be at least as good or better. So which one to chose?! Available for construction in lapstrake / marine-ply from CKD boats in South Africa, or many other suppliers worldwide - see http://www.dixdesign.com/kits.htm. CH21 has advantages in larger accommodation, challenging waters, and availability of kits for D.I.Y. 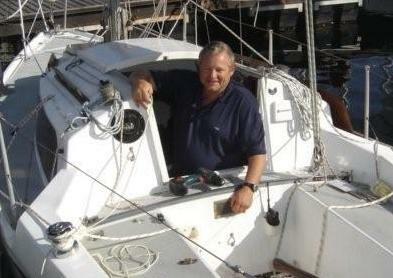 The bilge-keel option may also be an attraction for drying-out moorings. So now you can make up your mind. Q.E.D. STOP PRESS 2: News from Dudley is that the Cape Charles 32 is imminent - its at a stage where I think he would take an order? See the preview on Dudleys Blog This one is substantially larger at 32' LOD, and will make a very decent and versatile cruiser. It will be offered with the option of a modern Marconi rig which looks quite interesting.